The ferry operator NorthLink has said it is replacing plastic straws with paper ones on all its sailings in an effort to tackle plastic pollution in seas and on beaches. The firm is also looking at replacing plastic bags, cold drinks cups and ramekin dishes with paper ones. Sachets of sauce will also be replaced with pump action containers. Last week Western Isles' Comhairle nan Eilean Siar pledged to go plastic straw-free. MSP Kate Forbes said it was the first Scottish council to make the commitment. In a statement on its Facebook page, NorthLink, which runs ferries to and from the Northern Isles, said: "We look forward to working with local wholesalers for eco-friendly alternatives." Seumas Campbell, customer service director at Serco NorthLink Ferries, later said: "We are very proud to be reducing single use plastic and other disposable products on board our ferries. "In September we removed disposable paper cups with plastic lids from our passenger cabins and replaced them with reusable ceramic cups. "This week we removed plastic manufactured cotton buds from our on board shops and by the end of the week we will no longer offer plastic drinking straws as we will be introducing paper straws. "We look forward to continuing this important approach and working with our local suppliers to ensure we do what we can to help protect the environment." 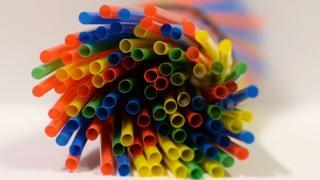 Last month, a Scottish village became plastic straw-free after a campaign by school pupils. Ullapool is believed to be the first village in the UK to halt their use in all bars, restaurants and cafes.